Join our £3 million BMD certificate bonanza! COMING SOON! I calculated this week that, between us, LostCousins members own well over 300,000 BMD certificates - which would cost £3m to buy at the current price of £9.25 each. Until now the only person who could see the certificate information has been the person who entered it, but from next month you'll be able to see which certificates are held by your cousins (and other members you've been matched with), so you'll be able to ask for copies if you don't already have them in your collection, or volunteer copies of certificates that you do have, but which your relative doesn't. IMPORTANT: if for any reason you don't want the other members you've been matched with to know which certificates you hold for the relatives you've both entered, you'll need to delete the ticks before this new feature goes live next month. If there are a large number I can do it in your behalf. I hope that, like me, you'll take the opportunity to update your My Ancestors page to include certificates you hold but which aren't already shown: to amend an existing entry simply click on the person's name, tick the relevant box and click Save­ - it only takes seconds. It's very much in your interests to provide this information, because members you're matched with are much more likely to respond promptly if they know that you hold birth, marriage, or death certificates for some of their relatives. There are, of course, many websites where you people can post information about certificates that they hold, but anyone who has tried them will know that it's time-consuming to search and the chance of finding what you want is very low - often less than 1 chance in 1000 (whereas the chance of finding a match when you enter a relative from the England 1881 Census on your My Ancestors page is fifty times greater, at 1 in 18). With this new LostCousins feature the information is right in front of you, because the first thing you do when you make a match is to look at the My Contact page - so there's no time wasted. To display the My Contact page for a relationship simply click on the name or initials of the person you've been matched with. Note: if you're worried that scanning or copying certificates might not be legal, please see this recent article. Members of the Descendants of Deceased Adopted Persons (DAP) Group have been waiting more than 10 years for the Government to correct an anomaly in the adoption legislation that excluded them from accessing original birth information if their adopted relative [usually parent] had died without asking to see this information. We were elated when the Government announced in December 2013 that the law would change and that descendants would have the right to apply for an intermediary service to enable them to get the information they were looking for. The Regulations came into effect in October 2014, but were withdrawn due to a technical error which meant that the Registrar General was unable to disclose the original birth information to the intermediary agency, which was necessary to effect the clear intentions of Parliament. DAP was advised that it was a simple matter to correct the wording of the Regulations and that this would be attended to in January 2015. The Adoption Division at the Department for Education, assured the DAP Group that they were making this a priority and were keen to get the new regulation laid down. The ‘goal posts’ kept moving. The latest date given for the amendment to the Regulations was JUNE 2015, but it is very hard to believe that this will ever be resolved, when yet another delay has been announced by the DfE. They said that ‘new issues’ had been identified and due to other urgent priorities it had been decided to postpone laying the amendment to SEPTEMBER. Why have these new issues come up at the ‘11th hour’ and why were they not evident before? What relevance do they have to the matter in hand? I share their frustration - this is just the sort of thing that gives government a bad name. I raised this matter when I encountered the Education Secretary, Nicky Morgan, last autumn - and still the civil servants are vacillating, rather than implementing the wishes of Parliament. I'll be attending the roadshow in London on Thursday, as will at least two other LostCousins members. If you're going to one of the earlier roadshows it would be most helpful to have your feedback before Thursday. Something I didn't mention in the last newsletter was the closing date of the consultation - although it was in the consultation document. You've got until 27th August to put the family historians side of the case, so there's plenty of time to consider what we learn at the roadshows. I'll cover the key issues in this newsletter over the next two months, but it's your own views that are most important. This month Findmypast are offering NEW subscribers the opportunity to get the first month of a World subscription for just £1, $1, or 1€ ! It's a great opportunity for anyone who hasn't tried the new Findmypast site before, and a great way to get access to the British Newspaper Archive. Warning: if you have subscribed to Findmypast previously you will probably see a message that the discount code is no longer valid - please don't contact me when this happens (remember, the offer is for NEW subscribers). Of course, whilst the people I know at Findmypast are a nice bunch of people, they're not doing this out of the goodness of their heart - they’re hoping that some of you will continue to subscribe after the first month (in which case you'll be charged the full monthly rate). If you're not tempted to continue simply change the auto-renew setting at the bottom of the Personal Details page. This week a BBC programme showed how scientists can construct an image of a face based on genetic evidence from as few as 20 genes. The surgeon who presented the programme sent a sample of her saliva anonymously to the team in Belgium - and the results, which you can see here, are pretty impressive. Will it one day be possible to create images of ancestors who died before the invention of photography - or for whom no known photograph survives? The first problem would be finding a DNA sample - after all, we can hardly dig up our ancestors - though it's not inconceivable that we could reconstruct an approximation of their DNA from samples provided by a large number of their descendants. Already at the free GEDmatch site Tier 1 members (those who have donate $10 a month) can use a utility called Lazarus to recreate the DNA of a close relative - or rather, the results they would have got had they taken a Family Finder test. Last week the New York City Department of Health was directed by the Supreme Court of New York County to remove the name of Joseph Viola from the birth registration of Nina Montepagani following clear DNA evidence that he could not have been her father. You might wonder why this lady was prepared to dig up her supposed father's remains - she believes that her real father was a doctor who died 5 years ago leaving a fortune of $100 million. I imagine that the next step will be to dig him up (and perhaps when they do, they'll discover that he has turned over in his grave?). Historic DNA was in the news for another reason this week - analysis of the DNA of Kennewick Man, a 9000 year-old skeleton found in Washington State nearly 20 years ago, shows that his DNA is more closely related to modern Native Americans (or Red Indians, as we used to call them in the days before political correctness blunted our vocabulary) than to any other people. Ironically this discovery would never have been made if scientists had not won a 2004 lawsuit by arguing that Kennewick Man was not closely-related to the Native American tribes who wanted their 'ancestor' reburied. I resisted testing my DNA for a long time - and with good reason. Imagine that you are tossing a coin - it might come up heads 10 times in a row, and it might come up tails 10 times in a row, but it's 500 times more likely that in practice you'll get a mixture of heads and tails. If you're playing a game where you only win when you get all heads or all tails, the chances are you're going to lose. It used to be much the same when it came to DNA testing. Until a few years ago the only tests available were Y-DNA tests, which track the direct male line, and mtDNA tests, which track the direct female line - in other words they track the two lines at the extreme edges of your family tree or pedigree chart. That's better than nothing, but inevitably most of our 'brick walls' are somewhere in the middle of our tree. These days the main focus is on autosomal (atDNA) tests, such as the Family Finder test from Family Tree DNA, because they can tell us about most of our ancestral lines. Why? Because we inherit autosomal DNA from both parents: roughly half comes from each parent, a quarter from each grandparent, an eighth from each great-grandparent, and so on. To generate meaningful results means analysing DNA at hundreds of thousands of locations, not tens or hundreds (as with earlier tests), yet because the analysis takes place on a customised chip the tests are cheaper. Because atDNA tests can match us with cousins from any of our ancestral lines the number of results is inevitably far higher. For example, I only got one meaningful match when I took a Y-DNA test and one when I took an mtDNA test - but when the results of my Family Finder test came through just under 3 years ago I got 123 matches. Inevitably most of them were distant matches - because most of our cousins are distant cousins - but I've continued to get more matches ever since. There were another 44 before the end of 2012, 100 in 2013, 176 in 2014, and 95 already in 2015, including 12 so far in June! Taking a DNA test isn't a substitute for researching your ancestors using records - it complements traditional methods. Paperwork can be missing or deficient - and sometimes our ancestors were 'economical with the truth' - but DNA is always there, and it doesn't lie. Why test now? Partly because the tests are better and more affordable than ever before, but also because unlike documentary evidence - which is usually preserved for posterity in record offices, archives, and museums - DNA evidence gets diluted with every generation. If only I'd got a sample from my 1st cousin twice removed Marjorie, who died last year, I'd be in a much better position to solve the mystery of my great-great grandmother - because she was Marjorie's grandmother, so around a quarter of Marjorie's DNA came from her, whereas only about one-sixteenth of mine did. Another reason for testing now is because until Sunday you can save 10% when you order a Family Finder test from Family Tree DNA - and if you're British the price is further reduced by the recent recovery in the pound (the cost, including postage both ways, will be under £70 - which, considering you’re likely to get hundreds of matches is quite a bargain, certainly compared to earlier tests). DNA tests work much like LostCousins in the sense that the more people who provide data the more matches there will be - and you've also got the satisfaction of knowing that once you've taken your test (or completed your My Ancestors page) the matches will continue to come rolling in as others do their bit. Once you've tested your own autosomal DNA you'll probably want to persuade your cousins to test as well - because whilst you'll each have inherited different parts of your common ancestors' DNA. Even siblings inherit different parts of their parents' DNA - only identical twins have exactly the same DNA (because they come from a single egg). Tip: until Sunday you can also save on tests at Ancestry DNA when you follow this link. They're more expensive for those of us who live outside the US, but there are some advantages - so, as I had already tested with Family Tree DNA, my brother has tested with Ancestry. Please note that Ancestry do not offer DNA tests in every country, but the list is expanding. A year ago I reported how a DNA test taken by LostCousins member Frances had helped 'dustbin baby' Michelle Rooney to find her dad, a story that featured in the Daily Mirror. Sadly Michelle's father passed away last year at the age of 84, but in February Michelle's birth mother eventually saw her appeals, and the two of them finally met up, as this Daily Mirror article relates. Last November I wrote how Derek Hardwick, a volunteer at Saint Catherine's Hospice in Scarborough was helping patients by researching their family trees in order put their life in context and leave a priceless legacy for their families (you can read more about Derek's work here). At my request Derek has kindly put together a guide for anyone else who wants to follow in his footsteps - you'll find it here. There's an understandable tendency to believe something that fits our view of the world, and discard anything that doesn't - that's one reason why many of us prefer to read a particular newspaper. However, it's one thing to fool ourselves - it's different when we circulate information to others without first checking that it's correct. For example, Adam Rutherford recently wrote an article for the Guardian in which he claimed that he - and every other European - is descended from Charlemagne, and that everyone alive in the 9th century who has descendants alive today is the ancestor of every living European. He might be right - but in quoting the 2013 paper by geneticists Peter Ralph and Graham Coop he left out the important proviso "so long as populations have mixed sufficiently", so we really don't know whether he's right or not. Of course, the Guardian article got picked up by other writers, and unlike me they didn't go back to see what the original paper had said - this is how incorrect information eventually ousts the truth, much as online trees with glaring errors tend to multiply and overwhelm the few well-researched examples. Similarly I received an email this week from one of my oldest and dearest friends suggesting that I boycott Tesco because of the way that they are forcing dairy farmers to quit by paying low prices for milk. True, Tesco have done a lot of bad things recently, but as it happens this isn't one of them - like Sainsbury's they operate a scheme which ensures that farmers make a profit on their milk. But there are plenty of supermarkets which pay less - a lot less - for their milk, as you can see from this article, and they should really have been the target. Here's another example of misleading information - what was the date of the English Summer Bank Holiday, often referred to as August Bank Holiday, in 1968? There are plenty of websites that will purport to provide this information, but most of them are wrong. Note: a good share of what I write in this newsletter is designed to get you thinking differently - and if I'm successful I suspect you'll find it quite exhilarating! Earlier this year I gave a glowing review to File Under Family, a novel by Geraldine Wall which introduced probate genealogist Anna Ames - the author really brought the characters to life, and whilst it was more about families than family history that didn't spoil my enjoyment in the slightest. This month I treated myself to the second part of the trilogy, File Under Fear - in which our heroine takes on a very different case, one which puts her and her family in danger. The assignment seems simple enough - but she soon discovers that the client has something completely different in mind, and the mix of danger and discovery is as finely-balanced as anything you'll find in one of Steve Robinson's mysteries. I enjoyed the book so much that I did some sleuthing of my own to track down the author - and I hope to feature an interview with her in the next newsletter. One word of warning - do read File Under Family first as it does a very good job of introducing you to Anna's family and friends, who play an important role in the second book. According to a recent article on the Daily Telegraph website, nowadays only 1 couple in 5 has a traditional wedding cake on their special day - a great shame, because for me there's nothing that can beat a rich multi-tiered fruit cake. Queen Victoria's wedding cake was three yards in circumference and weighed 300 pounds - even more rotund than Victoria in her later years (a pair of her silk bloomers were auctioned last year - they had a 52in waist!). If you've got a yearning for Royal wedding cake (and more dollars than sense), head off to Beverley Hills next weekend where an auction house will be selling slices of cake from 5 Royal weddings, including the marriage of Prince William to Kate, and Prince Charles to Diana. You'll find more details - and pictures - here. I recently recommended using the Wayback Machine at the Internet Archive and found myself using it again last weekend, since the Society of Genealogists website was being updated, which meant I couldn't get access to the document I was after - a guide to the information recorded on birth, marriage, and death certificates for England & Wales. The advantage of using links to archived pages is that they'll still work, even if the website is reorganised, out of action, or completely closed. The disadvantage is that you'll see the page as it was, so it might be out of date - but that may not be a problem (it depends on the type of information on the page). My wife recently spotted a recipe in the newspaper which was supposedly part of a 'balanced' diet, yet the ingredients included 75g of butter and two teaspoons of oil - and this was breakfast for one person. How a breakfast that delivers 100% of the recommended daily intake of fat can be part of a balanced diet beats me! Although interest rates haven't gone up generally, I've noticed that recently I've been earning more on the money I've lent via Ratesetter, one of the leading peer-to-peer lending companies - for example, the rate on 1 month lending has been as much as 3% pa, and I recently got 6.8% for 5 year money. It's not completely risk-free, but because I only lend a small amount to each person the risk is well-spread, and so far I haven't lost a penny. If you register using this link and subsequently lend £1000 or more you'll get a bonus of £25 (which represents an extra 2.5% on a £1000 investment), but do first satisfy yourself that it's the right investment for you - like investing in stocks and shares, peer-to-peer lending isn't covered by the Financial Services Compensation Scheme, and what's right for me won't necessarily be right for you. Finally, I've just discovered that you can currently get a one month Platinum subscription to Genes Reunited for just £1 (the offer runs until the end of June). 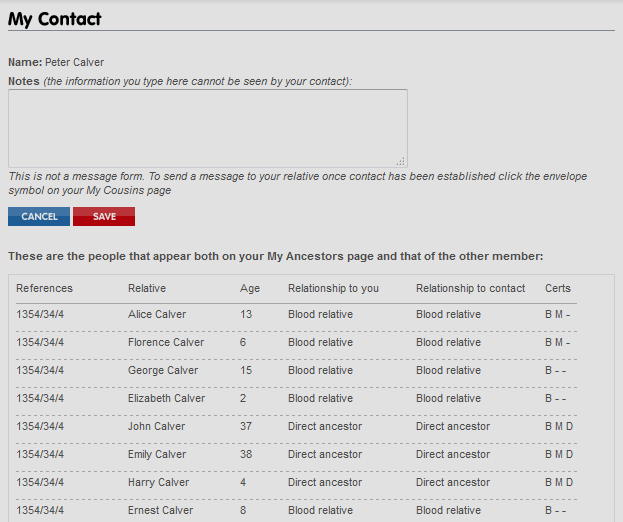 Whilst the range of records is much more limited than at Findmypast, there's also the chance of finding new cousins - I've made some very useful contacts through their site. Warning: at the end of the first month your subscription will automatically renew at the full price - unless you change the setting under Subscription Details from 'Auto Renew On' to 'Auto Renew Off'. Any updates or corrections will be recorded here. Please do not copy any part of this newsletter without permission. However, you MAY link to this newsletter or email a link to your friends and relatives without asking for permission in advance (though why not invite them to join LostCousins instead - standard membership, which includes this newsletter, is FREE?